It is recomended to monitor regulary operation of FIBARO Roller Shutter 2 in all modes. In case of gate control mode device, motor limit switches, infrared barriers and emergency stop should be monitored and maintained regulary . Roller Shutter 2 protects the engine from running for more than 4 minutes. Additionally short break is introduced before changing the direction. Venetian blind slats may be only operated by momentary switches. Switch connected to the S1 terminal operates the Q1 output, while the push button connected to the S2 terminal operates the Q2 output. It is recommended to connect an UP button to the S1 terminal and a wire, responsible of up movement, to the Q1 output terminal. 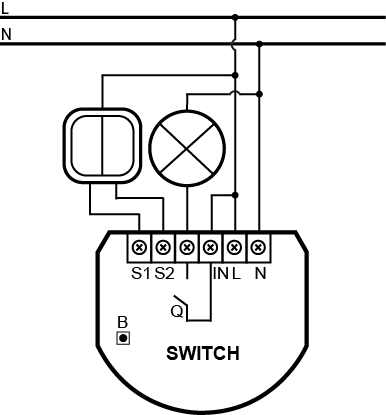 Respectively, a DOWN button should be connected to the S2 terminal and a wire, responsible for down movement, to Q2 the output terminal. FIBARO Roller Shutter 2 has a built-in Z-Wave network main controller’s range tester. Visual indicator pulsing green – Roller Shutter 2 attempts to establish a direct communication with the main controller. If a direct communication attempt fails, the device will try to establish a routed communication, through other modules, which will be signalled by visual indicator pulsing yellow. Visual indicator glowing green – Roller Shutter 2 communicates with the main controller directly. Visual indicator pulsing yellow – Roller Shutter 2 tries to establish a routed communication with the main controller through other modules (repeaters). Visual indicator glowing yellow – Roller Shutter 2 communicates with the main controller through the other modules. After 2 seconds the device will retry to establish a direct communication with the main controller, which will be signalled with visual indicator pulsing green. Visual indicator pulsing violet – Roller Shutter 2 does communicate at the maximum distance of the Z-Wave network. If connection proves successful it will be confirmed with a yellow glow. It’s not recommended to use the device at the range limit. Visual indicator glowing red – Roller Shutter 2 is not able to connect to the main controller directly or through another Z-Wave network device (repeater). FIBARO Roller Shutter 2 allows for connecting push buttons to the S1 and S2 terminals. These may be momentary or toggle switches, alternatively. Push buttons are responsible for managing the blind’s movement. Clicking up button connected to the S1 terminal, initiates up movement. Clicking down button connected to the S2 terminal, initiates down movement. If the blind is moving, each click, of any button, will stop the movement. In addition a button click sends a command frame to 1st association group devices. In case of venetian blinds it is possible to manage the slats angle. Operating Mode – Venetian Blind, or Parameter 10 value set to 2. Holding up button connected to the S1 terminal initiates slats rotation up. Holding down button connected to the S2 terminal initiates slats rotation down. In addition a button hold sends a Fibar Command Class control frame to 2nd association group devices. Changing up button position connected to the S1 terminal, initiates up movement. Changing down button position connected to the S2 terminal, initiates down movement. Choosing a middle position stops the blind. FIBARO Roller Shutter 2 has a MENU with each position indicated by the specified LED indicator colour. After including into the Z-Wave network, FIBARO Roller Shutter 2 will be presented in a Home Center interface as a roller blind icon. After choosing Venetian Blind device type, a second icon will show up, responsible for managing slats position. Opening/closing a blind is acheved through moving a slider or pushing a button. In Venetian Blind mode, setting slats angle is achieved through moving a slider or pushing a button shown. Above operating modes and their default settings are modified automatically only in Home Center controller. In case of the Z-Wave network controllers from other manufacturers, these settings need to be manually adjusted. Calibration is a process during which a Roller Shutter learns the position of the limit switches and a motor characteristic. Calibration is mandatory in order for the Roller Shutter to correctly recognize a roller blind position. The procedure consists of an automatic, full movement between the limit switches (up, down, and up again). There are separate procedures of calibrating roller blind and slats (venetian blind) positioning. Each time the calibration requires the completion of a full cycle (up and down). To abort the calibration process press any button (connected to S1 or S2) or send a STOP control frame through the Z-Wave network controller. In Gate Controller mode the calibration process will be aborted after disconnecting the S2 terminal. In Venatian Blind mode, slats need to be calibrated to work with any given motor. 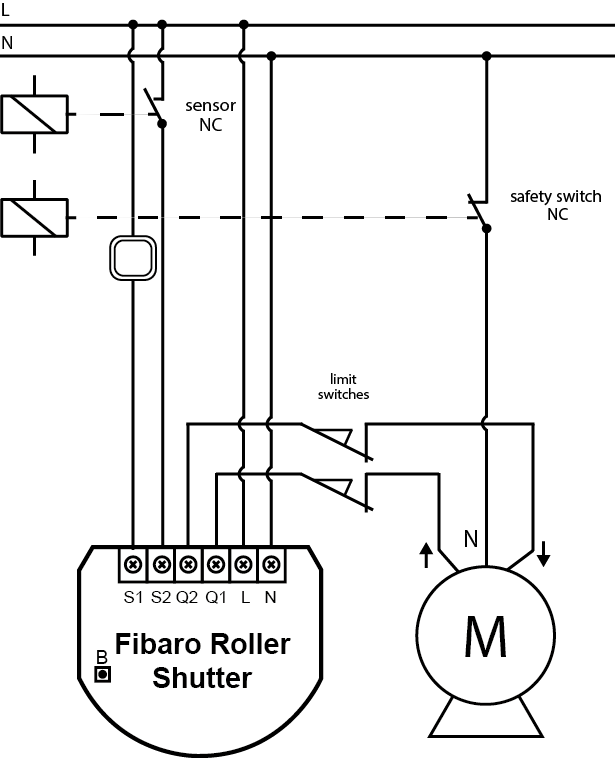 There are 5 procedures of calibrating a Fibaro Roller Shutter to choose from. Each one gives the same results and the user may choose which one to execute. It is possible to force the calibration process execution through sending a Fibar Command Class control frame through a Z-Wave network main controller. 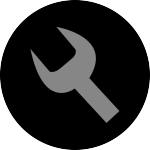 Another device icon, responsible for slats operation, will show up in the Home Center interface. In case of any other Z-Wave network controllers managing the slats position is achieved through pressing and holding a switch key (up or down). By default, time of transition between extreme positions is set to 1 500 ms (1.5 seconds). Turn slats between extreme positions. If after full cycle a blind starts moving up or down, then parameter’s 12 value must be modified, e.g. to 1 000ms (1 second). Correctly configured slats should not force the blind to move up or down. 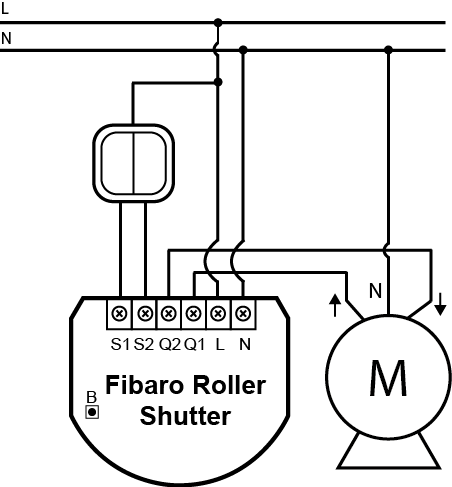 FIBARO Roller Shutter 2 allows to operate gate motors. Gate motor should be connected to Q1 and Q2 terminals according to installation diagram. In the Gate Mode, a momentary switch may be connected to S1 terminal. It is recommended to connect an IR barrier, an emergency stop button or any alarm mechanism to S2 terminal. Opening a contact in a device connected to S2 terminal will always result in stopping a motor in current position. Clicking a push button connected to S1 terminal will initiate opening the gate. Next click of a button will stop the gate. Yet another click of a button will close the gate. According to following seaquence: OPEN → STOP → CLOSE → STOP → OPEN. In Gate Mode, by default, the S1 terminal is set to operate with a momentary switch, ignoring the settings of parameter 14. Full opening the gate initiates a Roller Shutter 2 COUNTDOWN. After the COUNTDOWN the gate will start closing. COUNTDOWN length is set through the parameter 12. In addition, if the IR barrier is cut (S2 contact opened) at the gate fully open, the gate will start closing after a time period specified in parameter 17. In both Gate Modes, with and without positioning, parameters 12 and 17 are automatically set to 0. At these settings the gate will open, but will not automatically close. Relevant times need to be set manually in parameters 12 and 17. Parameters 12 and 17 settings are automatically modified only in Home Center controller, when choosing one of Gate Modes. In case of controllers from other manufacturers these parameters need to be set manually. Installation of the gate driver may be performed only by certified professionals. The motor must be equipped with the appropriate limit switches. It is recommended to connect a NC (normally closed) contact of an IR barrier to S2 terminal. Opening the contact will stop the gate. In addition, it’s recommened to connect an emergency stop button to the motors neutral (N) wire. In emergency, pushing the emergency stop button will cut the power and stop the gate. It is recomended to monitor regulary operation of FIBARO Roller Shutter 2 in all modes. Also it is recomended to regulary verificate and maintenance connectors. S1 and S2 terminals react to mains voltage only. Using IR barriers with NC contacts operating on lower voltages require using an additional relay. Clicking up button connected to the S1 terminal will initiate up movement in associated Roller Shutters or wiil send Turn On command frame to the devices associated in 1st association group. Clicking down button connected to the S2 terminal will initiate down movement in associated Roller Shutters or will send Turn Off command frame to the devices associated in 1st association group. Holding up button connected to the S1 terminal will move the connected roller blind up and after 1 second delay it will initiate up movement in associated Roller Shutters or will send Turn On command frame to the devices associated in 2nd association group. Holding down button connected to the S2 terminal will move the connected rolled blind down and after 1 second delay it will initiate down movement in associated Roller Shutters or will send Turn Off command frame to the devices associated in 2nd association group. Using association mechanism to operating venetian blinds requires configuring both 1st and 2nd association groups. Clicking up button connected to the S1 terminal will initiate up movement of the connected venetian blind and other devices associated in 1st association group. Clicking button, connected to the S2 terminal will initiate down movement of the connected venetian blind and other devices associated in 1st association group. Once the associated devices are already moving, they will be stopped if any of the buttons is pressed and held. Reset procedure erases memory of the device, including all information on energy consumption, calibration, the Z-Wave network and the main controller. FIBARO Roller Shutter 2 can send Scene ID to trigger scenes in the controller. Different actions with switches connected to the Roller Shutter 2 will result in sending different IDs. Change parameter 50 to 1 in order to enable Scene Activation functionality. 16 : 1 x click S2 input disabled due to the parameters configuration. FIBARO Roller Shutter 2 allows for the active power and energy consumption monitoring. Data is sent to the main Z-Wave controller, e.g. Home Center. Measuring is carried out by the most advanced micro-controller technology, assuring maximum accuracy and precision. FIBARO Roller Shutter 2 uses the Protection Command Class v2 to prevent from unintended motor movement. 0 – no protection. Roller Shutter responds to push buttons. 2 – Local protection active. Roller Shutter does not respond to push buttons. Once the Local Protection is activated, the module stops responding to S1 and S2 push buttons. SCENE ID and association commands will not be sent as well. The only exception is the B-button. Menu and Z-Wave network inclusion, after the B-button or S1 push button triple click, are still active. In Protection Mode it will not be possible to control FIBARO Roller Shutter 2 from buttons. It is not recomended to control all Roller Shutters in this mode. There is one more exception in Local Protection. In Gate Mode, S2 (IR Barrier) is still active. It means if the obstacle is detected, the gate will stop, regardless the Local Protection State set. 0 – No protection. Roller Shutter responds to command frames. 1 – RF Protection active. Roller Shutter does not respond to the Z-Wave control frames. Once the RF Protection is activated, the module stops responding to command frames setting the blind position. It is still possible however to configure the device (advanced configuration parameters, protection modes) and checking it’s current state through polling (position, power, energy). 2nd association group is inactive when toggle switches are used or in Gate Controller mode (parameter 10). In case of controlling Venetian Blinds, control commands are sent in Fibar Command Class standard. FIBARO Roller Shutter 2 in 1st and 2nd group allows to control 5 regular and 5 multichannel devices per an association group. In case of associating only Roller Shutters the limit is increased to 15. 3rd group is reserved solely for the controller and hence only 1 node can be assigned. FIBARO Roller Shutter 2 allows to customize its operation to user’s needs. The settings are available in the FIBARO interface as simple options that may be chosen by selecting the appropriate box. Parameters value shoud be set to 1 if the module operates in Venetian Blind mode. 0 – Blind position reports sent to the main controller using Z-Wave Command Class. 1 – Blind position reports sent to the main controller using Fibar Command Class. To make sure whether Fibar Command Class is supported by Z-Wave network main controllers from other manufacturers, please contact the controllers manufacturer. In Gate Mode (parameter 10 set to 3 or 4) the parameter defines the COUNTDOWN time, i.e. the time period after which an open gate starts closing. In any other operating mode the parameter value is irrelevant. In Venetian Blind Mode (parameter 10 set to 2) the parameter influences slats positioning in various situations. In any other operating mode the parameter value is irrelevant. 2 – Slats return to previously set position in case of the main controller operation, momentary switch operation, when the limit switch is reached or after receiving a “STOP” control frame (Switch Multilevel Stop). This parameter is relevant only for Roller Blind Mode and Venetian Blind Mode (parameter 10 set to 0, 1, 2). In Gate Mode (parameter 10 set to 3 or 4) the parameter determines a time period after which a gate will start closing after a S2 contact has been disconnected. In this mode, time to turn off the Roller Shutter relays after reaching a limit switch is set to 3 seconds and cannot be modified. Time period for the motor to continue operation. By modifying the parameters setting from 0 to 1 a Roller Shutter 2 enters the calibration mode. The parameter relevant only if a Roller Shutter is set to work in positioning mode (parameter 10 set to 1, 2 or 4). 35. Managing slats in response to alarm. In Venetian Blind Mode (parameter 10 set to 2), the parameter determines how the slats will react upon alarm detection. In any other modes, the parameter value is not relevant. 0 – Do not change slats position – slats return to the last set position. 1 – Set slats to their extreme position. Power level change that will result in new power value report being sent. The parameter defines a change that needs to occur in order to trigger the report. The value is a percentage of the previous report. This parameter determines a time period between consecutive reports. Energy level change which will result in new energy value report being sent. The parameter defines a change that needs to occur in order to trigger the report. The device may include power and energy used by itself in reports sent to the main controller. Parameter determines whether scenes or associations are activated by the switch buttons. 1. What is a Roller Shutter module? Roller Shutter is a roller blind controller compatible with Z-Wave network. Roller Shutter module allows to control and position roller blind motors. 2. How big load can be connected to Roller Shutter module? 3. Can I connect Roller Shutter to my old roller blind controller? Generally no – Roller Shutter is designed to be connected directly to roller blind motor. 4. Does your Roller Shutter module can control DC motors? In fact no. DC motors uses different control technology so it cannot be controlled without additional executive circuit. 5. Can I control more than one module from my Roller Shutter? Yes you can – use association functionality and control up to 15 roller shutter modules from only one module. 6. How many roller blinds can be controlled by association mechanism? If you use Home Center 2 or Home Center Lite you can associate 15 Roller Shutter modules but it is not recommended to associate more than 10 devices in general. 7. Can I control and position roller blind of mechanical limit switches? Yes – these roller blinds are fully compatible with our roller shutter module. 8. Can I control and position roller blind with electronic limit switches? You can control such roller blinds but it will not be possible to position them. To control such roller blinds please modify parameter 10 for value 1. 9. How can I create a scene that will open roller blinds of certain level? You can enter desired open level in green box (45% for example). Red box is used for defining delay (10 seconds). 10. I have connected Roller Shutter module to my roller blind motor, but it moves only a bit and then stops, why? Probably you have roller blinds with electronic limit switches, please modify parameter 10 value to 1.